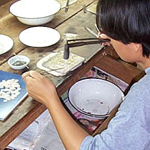 A lovely necklace by the expert hands of the Thai jewelry artisans. 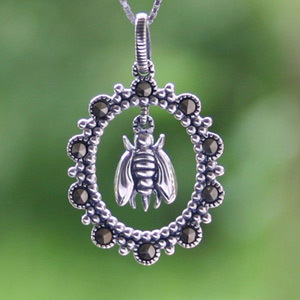 The master artisan designs the pendant after a bee nestling in her cell and enhances the shiny luster of sterling silver with marcasite. 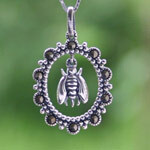 This marcasite and silver pendant necklace is handmade by jewelry artisans in a workshop located in Bangkok, Thailand.